amoxicillin over the counter buy now The Shared-Use Mobility Center (SUMC) is partnering with the California Air Resources Board (CARB) and the City of Los Angeles to launch a first-of-its kind carsharing pilot project focused on serving low-income residents in L.A. The goal of the three-year pilot, which is funded with $1.67 million in state cap-and-trade revenues, is to reduce greenhouse gas emissions by introducing electric carsharing fleets into disadvantaged communities. This unique project — which was named to the Sustania100 list of the 100 most innovative urban sustainability projects in 2016 — is designed to increase access to transportation for hundreds of thousands of Angelenos, while at the same time attracting new private-sector investment, increasing public awareness of electric vehicles and cutting congestion and harmful emissions. The project will add approximately 100 electric and hybrid carsharing vehicles and 200 charging stations in disadvantaged communities in and around Central Los Angeles. It also aims to recruit at least 7,000 new carsharing users, who in turn are expected to sell or avoid purchasing 1,000 private vehicles, reducing annual greenhouse gas emissions by approximately 2,150 metric tons of CO2. best place to buy cialis online Focusing capital-intensive investments in disadvantaged (often urban) neighborhoods. The LA EV carshare project introduces electric charging infrastructure into communities that rank within the top 10% most disadvantaged communities as determined by the California EPA. Without focused projects like this, such infrastructure may be less equitably distributed. http://azithromycin-otc.com/ buy azithromycin over the counter Mitigating carbon impacts. With an affordable and convenient all-electric fleet, the LA pilot encourages members to sell or avoid purchase of a private car. As a result, for every vehicle added to a carshare fleet, 9 to 13 private vehicles are taken off the road. Generating good jobs. The initial $10 million private investment from Bollorè Group will help to create both short-term and long-term jobs. As part of a City partnership, all jobs tied to this contract must also meet First Source Hiring standards to direct job opportunities to the project neighborhoods. Using public funds efficiently. This project leverages at least three private dollars for every public dollar spent. The contract includes commitments to discounting membership and usage costs for low and moderate-income members. And the EV infrastructure – made possible thanks to this initial capital investment from Bollorè Group – reverts to City ownership after 10 years. Additionally, a local Steering Committee will assist in program outreach to help ensure the project is relevant and accessible to residents from a wide range of backgrounds. The committee is led by several community-based organizations including the Koreatown Immigrant Workers Alliance, TRUST South LA, and the Salvadoran American Leadership and Education Fund. Additional partners include Enterprise Community Partners, NRDC and Move LA. 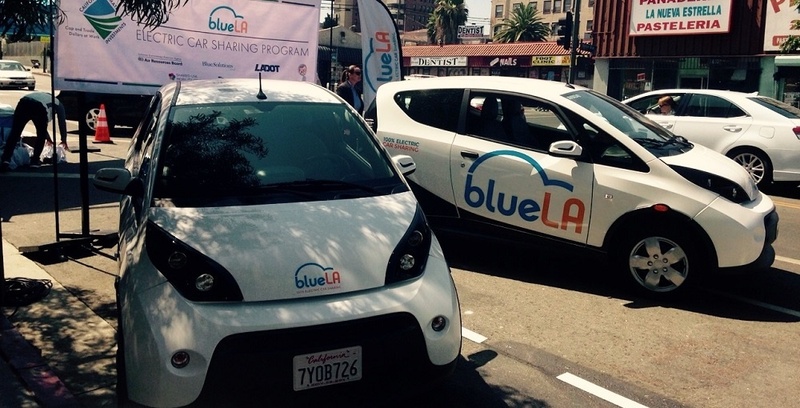 More information on the LA EV carshare pilot is available here.